The last group that I'll discuss is the Electron Movers. I was one of the group's original members along with Laurie McDonald, Robert and Dorothy Jungels and Dennis Hlynsky. As with so many of the other groups, we came together from within an academic video program, in this case from Rhode Island School of Design. In 1970 RISD purchased the art school's first video equipment. It consisted of two Sony videotape recorders, a portapac, and a studio camera. In the spring of 1971 Raindance came to the school to run a series of video workshops. The following fall a video program was started under the direction of Robert Jungels. After viewing some tapes from the National Center for Experiments in Television at a local PBS affiliate station Jungels wrote to Brice Howard for more information about the work. This initial contact led to Brice Howard visiting the school to conduct a series of workshops in December of 1971. Until the meeting with Howard, the E. A. T. experiences had been held up as the ideal model for collaborations. While the E. A. T. model promoted the "artist/technician" relationship, it existed within a very high-tech/high powered environment. Brice Howard introduced his video mix idea. This new approach paralleled Marshall McLuhan's concept that the Information Age would break down the traditional hierarchy of management within the industrial society. For me Howard's concept provided a reasonable foundation upon which to build my formal study of the medium along with a formula for social interaction. The procedures of the "video mix" were very similar to the the decision making processes within the Quaker Meeting and the American Friends Service Committee. In the Quaker Meeting all decisions are reached by a consensus as opposed to a democratic procedure. These decisions are reached through compromise and an open exchange of information. I was actively involved with both of these groups from 1969 through 1971 working in service projects and community organizing. In 1973, I lived with Scott and Helen Nearing in Haborside, Maine. The Nearings had left the urban society during the 1930's to pursue an agrarian lifestyle free of the capitalist modes of production. Like Brice Howard they stressed an involvement with tools that was rooted in spiritual and social interaction. The Nearings insisted that I strive for an understanding of the relationship between my environment, my tools, and myself. This strong combination of spiritual, social and intellectual issues helped to establish my personal code. I was particularly interested in video's capacity to layer moving images and sounds through real time manipulation. Brice extended my understanding of visual collage into an informational collage that layered not only images and sounds but the personal experiences of the group upon one surface, the television screen. At the time Dennis Hlynsky and I were collaborating on art projects that addressed photography and installation. The video students at Rhode Island School of Design began to approach video in two distinct ways. There were those who were influenced by Alan Sondheim, a teacher of critical studies, who regarded video as a transparent medium for documenting visual processes occuring in front of the camera. The work was closely associated with the conceptual art video of Vito Acconci and Bruce Nauman. The other group of students were concerned with the electronic design surface of the video monitor. Dennis Hlynsky, Laurie McDonald and I were in this group. Robert Jungels went out to visit the National Center during the winter of 1972 and was directly exposed to the philosophy and procedures of the "video mix". It was also at this time that Jungels met the tool designer for NCET, Larry Templeton. He commissioned him to build a set of video processing tools for RISD. That spring I met Woody and Steina Vasulka at Technisphere, a video dealership in New York city that was known for modifying equipment for artists. In April of that year, at the invitation of the Vasulkas, I exhibited my work at an open screening at the Kitchen and was invited by them to take part in the Kitchen's first video festival devoted to electronic image processing. Laurie McDonald began to exhibit her work in women's shows in New York and Canada. During the school year of 1972 - 1973 the Vasulkas and Brice Howard were visiting artists at RISD. Hlynsky, McDonald, and I had our first show at the Kitchen as a group. Larry Templeton completed building the first processing tools for the school. Robert Jungels started a dance/video project in conjunction with Brown University's dance program. This initial attempt to start a video/dance project was unsucessful, do mostly to the traditional predefined roles of support technicians and performers. However, the following fall, Jungels brought in his wife, Dorothy, to continue the dance/video project. This time the video students were going to learn how to dance so that they would have a better understanding of performance and dance space. Dorothy Jungels was trained in traditional ballet and modern dance. The dance/video class involved traditional warmup and then an improvisation section using the video processing equipment to translate the three-dimensional dance space into two dimensional video space. During the Fall of 1973, Laurie McDonald and I were visiting artists at Bucknell University along with Videofreex/Media Bus, T.P. Videospace Troupe and People's Video Theater. T.P. Videospace conducted a sixteen hour performance that culminated in a morning celebration uniting all the channels of video imagery into one space on a number of television monitors. This concept of transmitting a signal between two spaces in addition to the manipulation of the video screen became an important influence and changed our attitudes about what video dance might be. In Dorothy Jungels' class we began to set up video installation environments that surrounded the dancer with monitors in such a way that they could see the video image regardless of their position. We aimed a camera at a drawing pad and the image from the drawing pad was super-imposed over the dancer. An improvisation was then created by marks of the hand drawing and the movements of the dancer. Sometimes the marks resembled a score and other times the marks acted as a documentation of the dancer's movements. Over the next five years various dance/video projects were carried out at either Rhode Island School of Design or at the Electron Movers loft on North Main Street. In January of 1974, Dennis Hlynsky, Laurie McDonald, Jamie Daglish, and I were interns at the National Center for Experiments in Television. It was our first opportunity to interact with sound equipment (the Buchla synthesizer) and video equipment simultaneously. At RISD most sound work was done in pre-production or post-production so its role in the "video mix" was minimal. Much of our time was spent with light artist Willard Rosenquist or Bill Roarty. A typical video mix consisted of a setup not unlike the traditional still life. A construction of cut mylar and torn paper would be set upon a table. Four black and white video cameras would scan different parts of the construction. Surrounding the setup were at least three lights on dimmers. The video mixer allowed all four images from the cameras to appear simultaneously on the screen. The images could also be routed through a eight level video colorizer and mixed back through the video mixer. Either McDonald or I would play the Buchla synthesizer during the video mix responding to the image on the monitor as if it were the sound score. Sometimes this process went on for hours. In" Living Together in Our Apartment", 1974, Dennis Hlynsky and I started the process of the mix at three o'clock in the afternoon. Twelve hours later for a period of fifteen minutes videotape actually rolled to record the process. Our internship lasted for just three weeks, but this intense period of interaction led us to decide to stay together as a collective to continue the collaboration. That spring, Robert and Dorothy Jungels, Dennis Hlynsky, Laurie McDonald, and I formed a non-profit organization, the Electron Movers, Research in the Electronic Arts Inc. Our collective shared loft space with another arts organization known as What Cheer Arts whose members included Dale Chihuly, Jamie Carpenter, Richard Fleischner, Hardu Keck, Mary Shaffer, Duff Schweninger, and Gilbert Franklin. 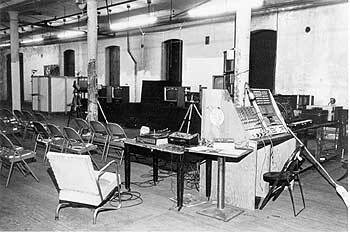 By the fall of that year the Electron Movers had moved into our own 2500 square foot loft in Providence. Hlynsky received a RI State Arts Council fellowship and I received a National Endowment for the Arts fellowship. This funding was the seed money for our studio equipment. Hlynsky bought the start of a video editing system and I commissioned George Brown, the Vasulka's tool builder, to build a six level video keyer/mixer that could be upgraded for computer interface. Within a year, by pooling our resources, we had a six level George Brown Video Mixer, Larry Templeton's Video Quantizer/colorizers, video editing equipment, four video cameras, and a half dozen television monitors. 1974 through 1978, Electron Movers exhibited as a group. Our major show was called the "Video Maze" (1974 - 1976). This was an interactive video installation that combined audience participation within the confines of electronic technology, altering the environment. The Video Maze was installed at the Everson Museum of Art (1975), Currier Gallery of Art (1976), University of Mass. (1976,1977), and at Rhode Island School of Design (1974). Other installations were done at Artpark (1977), Lewiston, N. Y. and at the New York Avant Garde Festival (1974,1975,1978). video dance and using the videospace to undermine the traditional concepts of gravity, dance space and presence. Ed Tannenbaum was building electronic tools to define his style. Dorothy Jungels used video to extend her dancing by documenting the history of social dance and by using video tools in workshops at the state mental hospital. Robert Jungels was most interested in performance and installations ...the social and spacial manipulation of reality by television. He played with the ideas of television°s mythical and magical manipulation of the culture. My own interest at this time was in the layering of images on the video monitor as metaphor. I looked upon a landscape and would electronically manipulate the image to evoke a sense of time change and history. Two of my works from this period were "Lost River Installations" 1977 Artpark, NY and "Hanging Around with Mussolini" 1978 Providence, RI. I was also performing live pieces such as "Communion", 1977, where I stood absolutely still for 24 hours using a time lapse video recorder to document the change in the day and my movements. The 24 hours were then reduced to 45 minutes in playback using this equipment. By 1977 a number of incidents and pressures started to break the group apart. The art world was no longer interested in the social function of the alternative media groups, had begun to focus once again upon the work of individual artists and individual tapes. It became much easier for us to arrange solo shows than it was for Electron Movers to be shown as a group. The last exhibition we had. collectively was in 1978. Because Electron Movers also functioned as a community media center there was always a constant flow of people through the studio. We all developed collaborations with other artists outside of the original group of six. Ed Tannenbaum worked with Curtis Shreier of Ant Farm on a tape called Greetings from Space (1977) which was the first computer generated video to come out of the studio. Dennis Hlynsky started working with the Providence Park's department on celebration pieces. Laurie McDonald worked with Bob Rizzo and Jamie Shreve on dance video pieces. I spent two years (1976 - 1978) working with the sculptor, Richard Fleischner, documenting the installation of his sited work known as the "Cow Island Project". In 1976 I also started working with fiber artist, Connie Coleman, documenting her environmental sculptures and floating constructions. This latter collaboration developed into an intimate relationship and we were married in 1978. Although she worked with me on a number of video projects from 1976 until 1979, it wasn't until the following year that we made the decision to work under the name of Coleman and Powell. an outside manager to run the studio and I left the group that summer. The new manager turned the studio into a video production house specializing in work for non-profit institutions. Larry Hyle, an electronics designer, Randy Walters, a musician, and Philip Palumbo, a visual artist, joined the group during 1978. Within two years they disbanded because of financial mismanagement and the high interest rates on their equipment loans. All of the members of Electron Movers have continued to work in video. Dennis Hlynsky is making documentaries about young people with cancer confronting death. Robert Jungels has a production company specializing in industrial and cultural documentaries. Laurie McDonald moved to Houston, Texas to run the video program at the Southwest Alternative Media Center and continues making art. Dorothy Jungels is still dancing and uses video as a choreographic tool. Ed Tannenbaum is the artist-in-residence at the San Fransico Exploratorium. Larry Hyle went on to develop the Auroa Computer paint system. Randy Walters and Philip Palumbo are still involved in various phases of television and music production. Connie Coleman and I maintain the Coleman and Powell collaboration and our studio in Philadelphia, PA.
Electron Movers studio, Providence RI, 1976. Photo by Dennis Hlynsky. Courtesy of Laurie McDonald.